I've been doing a lot of dark colored templates recently. Here's a nice bright colorful template for Impress with some brightly colored rounded bars on the left side. I love space! Here is a minimal moon design to brighten your next presentation. I've finally found a little bit of time to make some more slide graphics! This pack is a series of actions that can be taken digitally that I thought might be prompts in a presentation. The 5 actions included in this pack are: Download, Print, Watch, Listen, and Search. 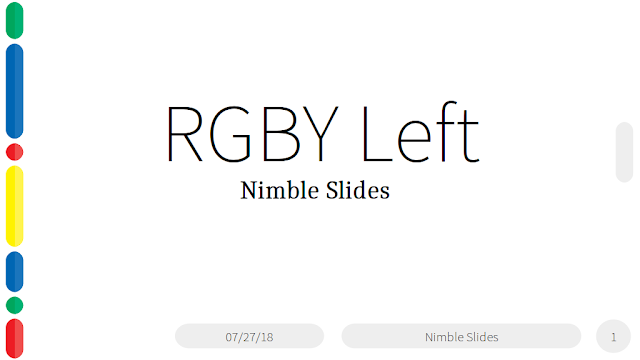 To continue my theme of minimally decorated slides with RGBY coloring, here's another nice clean template to add to your collection. Download the slides graphics from my Bracket templates.